Once arriving in Osaka the first thing we did was put our things way in the hotel. This hotel was so nice it had down comforters and a radio in the wall. After getting situated we made our way to the shopping district, which was right down the street form our hotel. The entire group walked through the district and stopped to eat at this nice little Japanese restaurant. I ordered these noodles that were seasoned very well. I also ordered chicken and this meat that looked to be steak but I’m not too sure what it was exactly. After eating I left to explore the city. Osaka stays up very late but not as late as Tokyo. The stores here in Osaka close at eight thirty compared to midnight in Tokyo. 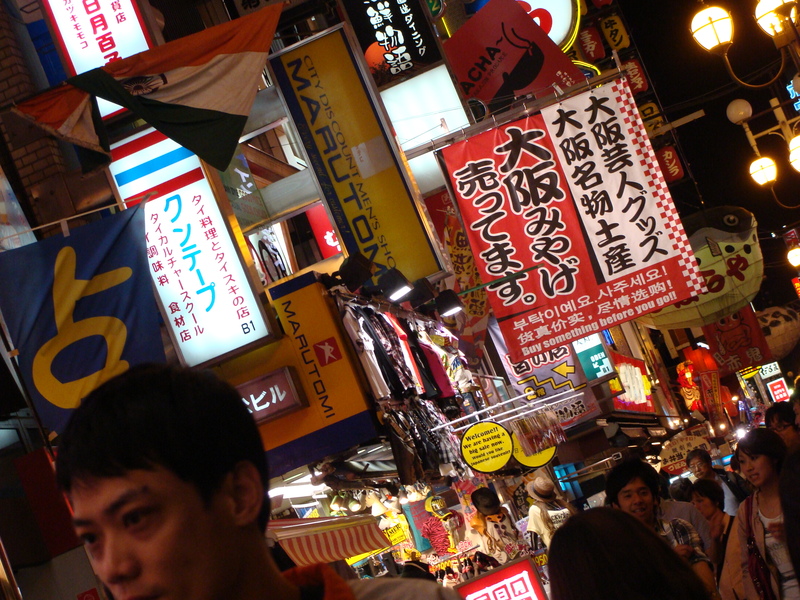 There are so many places to spend money in Osaka. Many of the stores are either video game oriented or clothing stores. I honestly think I like Osaka better than Tokyo, mainly because there are a lot less people in Osaka. Osaka is a lot less congested. The alumni dinner was so nice! I feel so special to be a part of such a cohort of people that share a common bond that is even more apparent thousands of miles over seas. I felt very welcomed by the alumni of Michigan State University as well as the Japanese hosts of the dinner. The food was great the people were so nice and inviting. The Alumni were all so willing to share their experiences and help us in anyway they thought they could. After eating all that my stomach could hold and networking with former MSU students and taking plenty of pictures my group members and I made our way to Osaka. I was having a little trouble carrying my luggage to the train station but I finally made it. We took the JR line to Osaka, Japan this Bullet train traveled at very high spends through mountains. Every few minutes my ears would pop. Other than my ears bothering me I really enjoyed the train ride. So today I went to visit one of many Japanese temples. This temple was in a location surrounded by many shopping venues. These venues sold everything you could think of. On the way to this temple I passed by many vendors and of food and clothing. I also stumbled into the middle of some type of parade that was going on in the street. A group of men all wearing the same clothing were carrying some kind of shrine. While carrying the shrine the men would bounce up and down simultaneously and chant something that I obviously could not understand because I don’t speak their language well. After finding the temple and going inside I viewed many statues of Buddha and different sacred places that I wasn’t too familiar with. While in the temple some of my group members had their futures told. Some future were prosperous and others not so much. I walk up the narrowest staircase I have ever seen to get to the fourth floor of a building that appears to be half of a building from the outside view. Once inside I met the founder of Q entertainment, my network has just grown substantially. 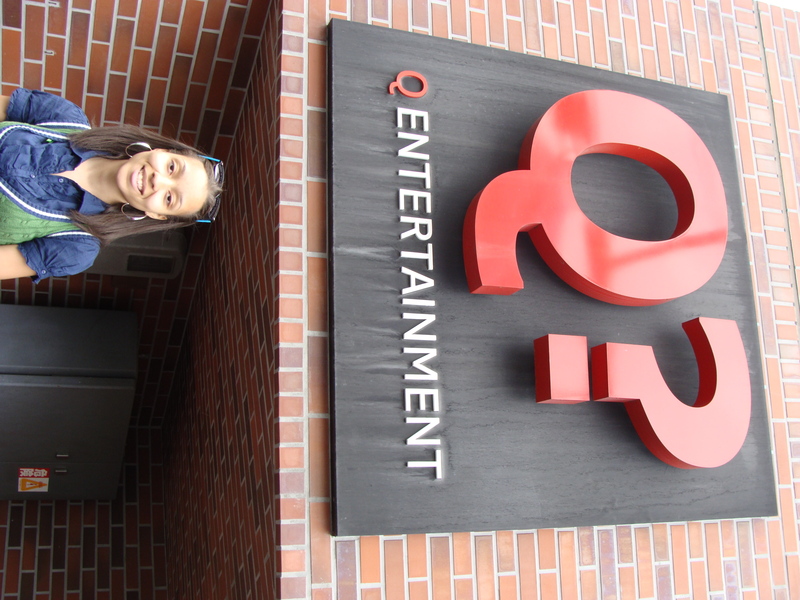 Q Entertainment stands for Quest of the Future. 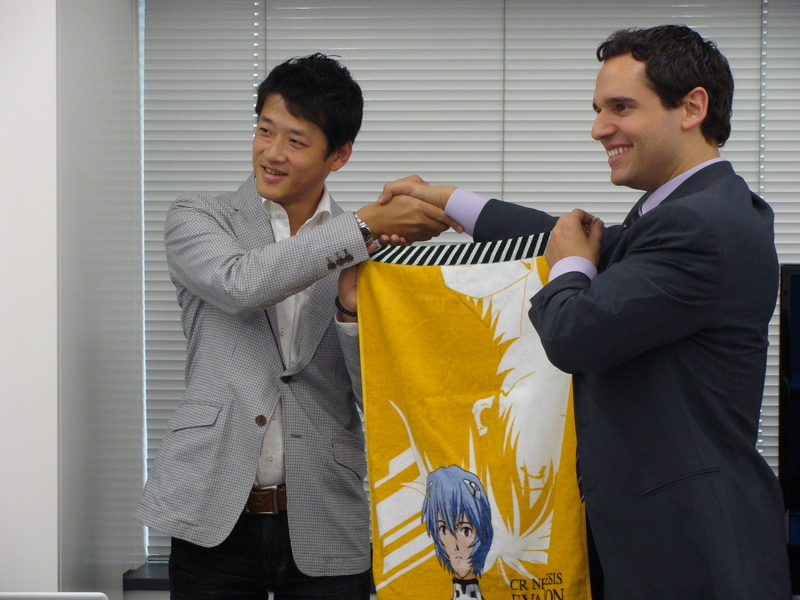 The founder of Q Entertainment Shuji Utsumi was a member of the Sony Entertainment of America founding member reading product development team. After working there for many years he decided to leave and create his own quest there in by staring is own company Q Entertainment. Q Entertainment is a video game company that creates new generation games not only for big name systems but also for multi-media outlets such as the cell phone markets in Japan. I took away a lot form the presentation giving at Q Entertainment because it left me with a lot of inspiration to learn all that I need to and then to feel comfortable enough to venture out and start my own company that is based on my vision. So much fun! I definitely think today was better than yesterday. After getting on a few trains and walking a little ways my group and I went to eat some authentic Japanese food for lunch. This food did not taste as bad has I expected it to. Some of my classmates went to McDonald’s, I guess they were trying to play it safe. After eating we went to Future Scope and Lucent Pictures this company is a partnership. They deal with video games as well as 3D movies. The presentation that I sat through at Future Scope was so intriguing, everything that they so there is all about getting new ideas out there that will appeal to the entertainment market. Future Scope not only makes video games for game systems but they also make them for cell phones. Lucent pictures the other side of future scope deals with making movies in 3D. 3D is the new wave on the market now. That is where the entertainment industry is going, in the 3D direction. Some examples that were shown to us by Lucent Pictures I don’t think I am allowed to divulge but it was very impressive. I also would like to add that the product that they are marketing I would invest in when it becomes available. At the end of the presentation the President of Future Scope gave our group free pictures and souvenirs that had images of certain video game characters. This was the best part of the presentation. I really enjoyed myself. Today was very full. 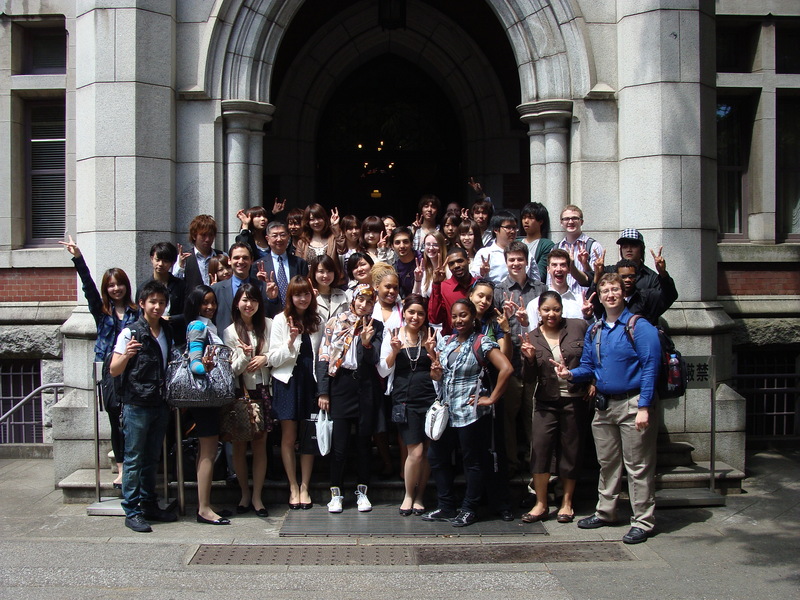 While studying abroad I made two company visits just in one day alone. The first on our agenda was D3 publishing. 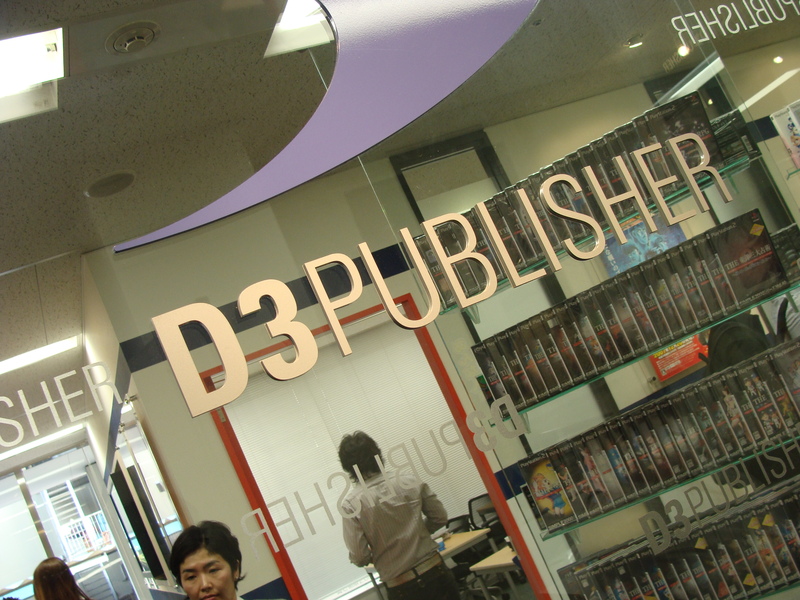 D3 publishing is a very well known video game publishing company that creates games such as Dream Club. D3 publishing won the Gold Prize for achieving sales over 500,000 discs and the Platinum prize for over 1,000,000. The experience that I had today was one that I will remember for years. I never thought I would be able to socialize with people on such a high corporate latter within the field I am interesting in. D3 publishing mad a very helpful and informative presentation about that company and how they conduct business pertaining to video games and Mango magazines. After leaving D3 publishing my group went to visit DNP Corporation is all about Information Communication Lifestyle Supplies and Electronics. This company spoke about publication printing as well as commercial printing. I learned a lot about Digital Media development and CG animation. DNP had new state of the art new age technology examples that were shown in their presentation. DNP innovations were very inspiring to me. It made me feel as if I could be as creative and invent something that could help the world in someway.